Happy Easter! 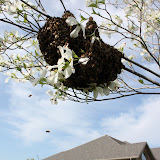 Swarm season is here! 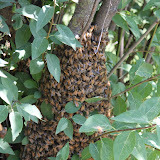 We besides the two calls for swarm removal that we have gotten. I checked into one of the double deep hives that came from Dave and found 8 Queen cells. One was ready to hatch and we soon should have a virgin queen in that hive within the next 24~48 hours. I checked the hive very closely for the existing queen and could not locate her. So, I am hoping that I got her with the split that I made of this hive last week and these are all new queens due to the hive being queenless. It amazes me to look inside a hive and then check back a week later to see how much the landscape has changed. The phrase "busy as a bee" certainly is a true one. I found comb almost completely drawn on foundation that was put in only a week ago. Also, please don'e ever tell me that plastic foundation is better than wax! I put 2 wax foundation frames in and left 2 plastic. Here was the configuration: 1W, 2P, 3C, 4B, 5B, 6B, 7C, 8W, 9P. Where W=wax foundation, P=plastic foundation, C=comb, B=brood. Both the wax foundation frames had comb drawn on them this week (just 1 week later). The plastic were still bare. So, I as if I wasn't already... I am truly a firm believer in wax foundation. I have either culled or planned to cull all plastic foundation from the new hives (sorry Dave). Another thing that i have become a big fan of is running 9 frames in all boxes. The bees just seem to like this configuration better. Of course you do have to watch it when they don't have drawn comb as they will pull the comb out a bit too far on one side if you have it next to a frame of foundation. I have found this only to be a minor nuisance. Flipping the frames 180, or dropping a frame of comb in next to them seems to do the trick when they do get a bit wild. OK, so the main reason for the inspection... I was pulling a frame of bees for my daughter's school presentation. Tomorrow, is our family's turn to present at my youngest daughter's home school Co Op. It should be lots of fun and I am so looking forward to hearing her and my wife sing. Basically, every family gets one day out of the school year to tell about themselves and present what they like to do as hobbies, work, etc... So, we will talk about our love of music and then the girls will sing. Then I will show off the bees.